Then and now: Tracy Rowlett in the early stages at CBS11 with co-anchor Karen Borta and in a current photo from the station's Web site, which didn't exist when he made the big move from Belo8. Note to readers: This article first appeared on Dec. 26, 1999, with anchor Tracy Rowlett still "on the beach" while waiting to debut as CBS11's new featured anchor. He was priming his new troops back then in hopes of someday overtaking his longtime old employer, Belo8, in the D-FW Nielsen ratings. Rowlett will be the featured guest on Saturday, Jan. 19th at 4 p.m., when Stratos restaurant hosts the second Uncle Barky Show. (See the above ad.) Here's a behind-the-scenes look at his impending big transition. He's become a paternal figure in recent months, mentoring rather than anchoring, inspiring his young charges simply by being there. Tracy Rowlett, late of WFAA-TV (Channel 8), now of KTVT-TV (Channel 11), hasn't brought you the news since April 6. Nonttheless, he's being revered on a daily basis by reporters who say they can't get enough of his verbal pats and pep talks. He says they simply needed a little "direction." They say it's much more than that. "I call him 'Father,' because people sort of view him as that," says Channel 11 reporter Steve Pickett. "It's amazing to watch how people gravitate toward him." Another young reporter, Dallas native J.D. Miles, grew up watching Rowlett on Channel 8, where he spent 25 years before signing a seven-year deal with Channel 11 last spring. "To have him anchoring while I'm live out in the field has been my dream," Miles says. "I would not want to be at Channel 8 right now, because I know how determined he is to beat them." All well and good -- but still very much up in the air. Rowlett, 57, may have won over a young staff of undernourished reporters. But his biggest challenge is coming to a screen near you. Can he put CBS-owned Channel 11's little-watched evening newscasts in the vicinity of ratings respectability? Might he, as Pickett puts it, "be our Moses, leading us to the promised land?" "I can't do anything all by myself," he says. "It has to be a team effort . . . Channel 11, in order to be competitive, had to take it up a couple of notches. They just had to. And I think that's what's happening." He's been retooling the team since August, when he joined Channel 11 after a prolonged contract struggle with Channel 8. An arbitrated settlement has prohibited the station from putting him on the air or promoting him until New Year's Day. He's allowed to be a Rock of Gibraltar, though. "The guy's an institution in this market," says sports anchor Babe Laufenberg. "He can do nothing but help us." Reporter Jim Acosta agrees, but says no one at Channel 11 "should look at Tracy Rowlett's arrival as the coming of our savior. I mean, if we're going to win in this market, we're going to have to do it on our own." 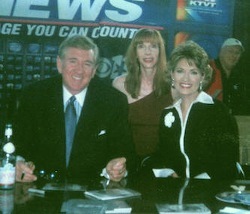 Rowlett's first on-air appearance for the station will be at midnight Friday to anchor a Y2K special. Then he'll spend another month off-camera, but with a new weekday 6 p.m. radio show on KRLD-AM (1080), while Channel 11 drumbeats his return to full-time anchoring on Feb. 3. That's the first day of the four-week "sweeps" ratings period, which promises to be the hottest local competition since November 1995 -- the first ratings period after Channel 11 aligned with CBS and Channel 4 with Fox. Channel 11 general manager Brian Jones says the station will promote Rowlett as a pillar in an already strong foundation. "Tracy's message should be, 'Don't watch because of me. Watch for all the reasons I came.' We've just needed something to get us high enough on the radar screen so that people will take notice." Rowlett's former Channel 8 teammate, anchor Chip Moody, says an anchor indeed can make a difference, at least in the short run. "When I went from Channel 5 to Channel 4 (in 1980), there was a significant shift in viewers. So I know it can be done," he says. "In this day and age, I think Tracy will help Channel 11. But I don't think it's going to be a big mortal wound into the muscle of Channel 8. "As much as anchor people would like to think they're the big deal, we really have to depend on the organization. Channel 8 has such a long tradition and reputation that it's going to be very difficult for any station to surmount that in the long term. But I think CBS and Channel 11 have made a very smart and dramatic move. So we'll see." On this December morning in Channel 11's Dallas newsroom, Rowlett is dressed as though he'll be anchoring at any minute. Dark, pin-striped suit, white shirt, red patterned tie. Only his hair, which curls over his ears, is a bit beyond standard anchor length. Meanwhile, Channel 11's newsroom has already gotten its trim. Shortly after Rowlett arrived, the station complied with CBS' order to cut 40-some employees from its payroll. Most were off-camera personnel, but two reporters -- Mark Annick and Ginger Gadsden -- also were dropped. Rowlett tries to put a good face on the situation, explaining it was "really a matter of just getting the body count at Channel 11 to be comparable" to similar-sized CBS-owned stations in other markets. "Until we can prove that we have a product that deserves a bigger budget, perhaps we're going to have to do more with less," he says. Rowlett begins his Channel 11 workday with a 9 a.m. story meeting in the Dallas newsroom. Bureau manager Mike Pool ticks off the possibilities while Rowlett dons eyeglasses, takes notes and offers suggestions. He is particularly intent on giving reporters the freedom to volunteer story ideas and act upon them. In the past, Rowlett says, "we had a shop that was remote-controlled out of Fort Worth," home of Channel 11's main offices. Reporters had become to robotically accepting story assignments, many of which were following the leads of competing stations, he says. "Our reporters were just sort of languishing out there. One of the things this place needed more than extra bodies and a bigger budget was just some extra direction. We have really capable people, but I think, frankly, that they were misdirected . . . What we're trying to do now is turn that around. We don't have to be followers. In a market this size, there's plenty of news to go around." It's the same kind of reporter-driven approach that Rowlett both preached and practiced during his quarter-century at Channel 8. 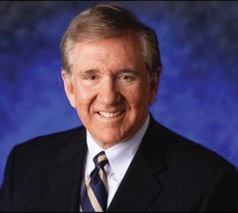 When he first began anchoring in the late 1970s, Channel 8's newscasts were a distant third in the market. Sometimes, he says, even Channel 11's "little rip 'n' read newscast (which served as an intermission for the nightly movie) would whip us in the ratings. It was pretty pathetic." But Channel 8 gradually overtook its competitors on the strength of nuts-and-bolts reporting and investigative series. Rowlett hopes Channel 11 can do likewise by ditching "flash and trash" and accentuating substance and enterprise. Reporter Cile Spelse says the difference already is tangible. "Many of the reporters weren't given he ear that they needed," she says. "It's much more pleasant to come in here every day now. Tracy is the one we all turn to for guidance and leadership." But it's not quite Eden yet. Reporter Marc Levenson bursts into a story meeting to complain that CBS' The Early Show is interviewing a person he's also been after. They won't let him do an interview as well, he says. "I think that stinks, and I just want you to know that!" he exclaims. "We work for the same network! Why can't we cooperate?" Rowlett seems more amused than concerned. He instead has a standard lament in mind: "It sounds like another one of those days, gang," he says, "where we've got more stories than we've got people." That usually wasn't a problem at Channel 8, which has dominated local newscast ratings for almost two decades. In the November sweeps, though, Channel 8's margin over second-place KXAS (Channel 5) shrank to 1.8 ratings points, compared to 3.7 points the previous November. And after four years in the basement, Channel 11 finally slipped ahead of KDFW (Channel 4) into third place at 10 p.m. The gap between Channel 8 and Channel 11 is still 7.8 ratings points (156,000 homes). But only a year ago, it was 11.7 points (234,000 homes). That's enough to make Rowlett smell blood. "One of the first things we have to do is set up confusion out there," he says. "Channel 8 looks different today than it has in a very long period of time. The news content is softer, the anchor presence is different. So I think a lot of folks out there are using their remote controls. If Channel 8 drops to No. 2 and Channel 5 becomes No. 1 in February then that sets up a few more visits to Channel 11. I think it makes good sense for us to set up those changes, because (viewers') old loyalties at least will be challenged." Channel 8 general Kathy Clements-Hill says the station hasn't gone softer, "but I'm not going to argue with any one individual's perception of that. I would put our integrity up against any other station in the country." She also disputes Rowlett's contention that Channel 8 management has a "very personal" vendetta against him and is focusing more on crushing Channel 11 than holding off Channel 5. "Tracy hasn't been in our newsroom since April," Clements-Hill says. "I'm not sure he can speak to what we're focusing on and what we aren't." The two sides have drawn symbolic battle lines, though. The focal point of Channel 8's lobby area is a pictorial display of the station's 50-year history. Of the dozens of photos displayed, none is of Rowlett. In Channel 11's Fort Worth lobby, Rowlett's picture for now is positioned next to three major CBS stars -- Don Johnson of Nash Bridges, Chuck Norris of Walker, Texas Ranger and David Letterman. While gearing up to anchor anew, Rowlett divides his time between the station's two locales, attending the 2 p.m. news meeting in Fort Worth after spending mornings in Dallas. "I know what this business is all about. I know how to do news," he says. "Right now we've got an old way of doing things here meshed with a new way. I think you'll be seeing less and less of that sensational, titillating stuff that all stations do. We used to say that the ultimate tease would be, 'Missiles launched. Details at 10.' "
His eventual 10 p.m. anchoring duties, from the Fort Worth studios, could hinder the hands-on nurturing of Channel 11's Dallas-based reporters. "I can't do both every day," Rowlett says. "I might sometimes come to the Dallas bureau in shorts and clogs, and just sort of ride herd over the 9 o'clock meeting. And then I can go back home and, if I have to, take a nap." Rowlett says he sometimes has missed anchoring "intensely" during his long sojourn. But the rarefied oxygen of "air time" doesn't sustain him the way it used to, he says. "If that's how you feed your ego, then there are all sorts of negative things that can happen to you. Anchoring is not the most important thing in my life anymore. My family is. My religion is. Being away from television gave me an opportunity to get back in touch with who I really am. "I enjoy being on the air probably as much as anybody. But one of the dangers of this business is when people who do the news think they're bigger than the news itself. If you fall into that trap, then I don't think you're good at anything much other than being an anchor." That said, Channel 11 will be paying him more than $1 million annually to be very good at one overriding task -- anchoring. What remains to be seen is whether he'll be Moses or a falsely worshipped golden calf. "Why do people watch him? Why do people believe him? I can't explain it," reporter Pickett says. "But I know that when he first walked in this door and gave us his vision of news, everybody's eyes just opened up. "He's not even on the air yet. But just his presence has made us better." For now, that's enough. But it's still spring training, with the real games just ahead. "I guess it's almost like a baseball player switching teams," says Rowlett. "You have to come back and play your old friends. We're all competitors now."